Satamap was launched in 2013, then publicly available in 2014. We had just the Landsat 8 imagery every 16 days. While it was often frustrating with cloud, managing one data set not overly complicated. Then Sentinel 2 came online which was a big step forward as we were getting an extra set of images every 10 days. This added more complexity but worked well. Once the Sentinel 2 sister satellite came on board our Sentinel 2 imagery doubled. At the same time our user base was growing demanding more. Yes we will admit loading times increased but this triggered and exciting time in the growth of Satamap, we started working on Satamap Global. Satamap Global is the new rebuilt Satamap than operates anywhere in the world. In addition, loading times were drastically reduced. We also got rid of the old tile system in favor of a point and radius type subscription which offers our users much more value. The original Satamap was a stepping stone to what we have now and we want to thank all of the initial customers that have made it possible to get to our current position. The system is much more 'scalable' now and growth in new customers will not impact the loading time for existing ones. We have plans to continue to improve our product offering and are exploring options for other imagery sources and analysis of current imagery. You can read more about Satamap Global features, use cases and pricing at satamap.com.au. Starting this season, users with a current Satamap subscription can access imagery inside Precision Crop Technology (PCT)’s online AgCloud and iPad app AgMap. 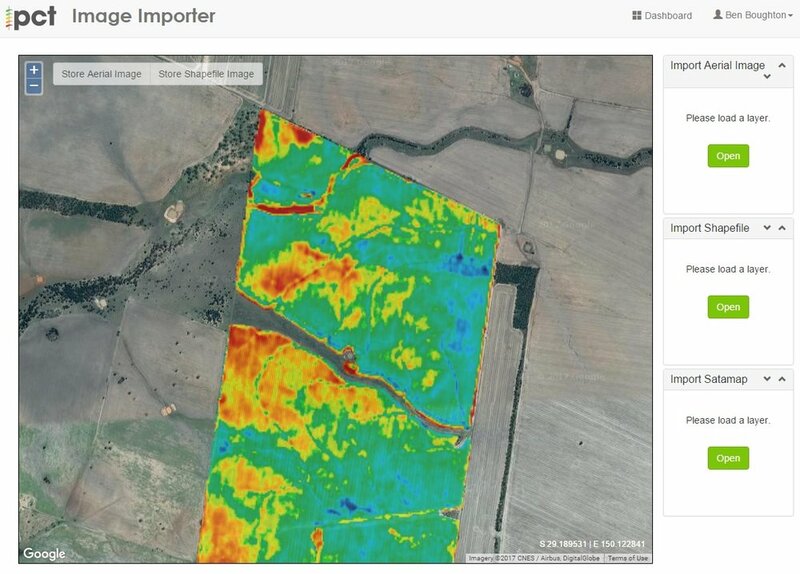 Importing Satamap imagery into the PCT platform allows you to view data scaled across individual paddocks and generate variable rate maps, plus more. There is a one off fee of $100 per grower to setup your account with PCT which includes importing your paddock boundaries as this does take some work. Once set up, as long as your Satamap subscription is current you can use the Satamap Importer to load up the latest satellite imagery (and old imagery too!). PCT has been providing services to agriculture in Australia and internationally since 2001. PCT offer several other quality precision agriculture tools inside the above mentioned applications. If you are already a Satamap Subscriber and interested in using AgCloud or AgMap please fill out this form. There will be a followup post with more specifics on using Satamap data inside AgCloud and AgMap. While most of our users primarily use Satamap as a scouting, management and monitoring tool, you can export Landsat 8 data from Satamap to be used in farm mapping software such as Farmworks and SMS Advanced. The following example is thanks to Brad Donald at B&W Rural in Moree. You may have spotted him around the country flying the AgEagle UAV. Brad is an agronomist and has a passion for technology in farming. Weedseekers/WeedIts are great for spot spraying weeds that are already established – but this is reactive rather than proactive. Residual herbicides such as Imazapic (Flame) are commonly used to aid in the control of summer grasses such as barnyard grass. Brad thought that if he could get an image from last summer that represents areas of the paddock that have a high biomass it would be a sensible assumption of a high seed bank. He would apply a higher herbicide rate in these areas than the rest of the paddock for the 2015/16 summer. Brad exported an image from 2013 as a POINT shapefile. With this he was easily able to import into SMS Advanced to generated a variable rate map. The ability to import into SMS Advanced and Trimble’s Farmworks as a POINT shapefile means these software packages deal with the data similar to yield data which makes for easy processing. Brad’s tip for this project is that the map was written to simply change water volume applied, which was done automatically by the rate controller. Application rate changes are limited to staying within certain pressure ranges for droplet size management. Variable rate map constructed from Satamap data for residual herbicide application. Well it’s 2016 and what better way to start then reflect on the year that was. For the team at Penagcon (who are passionate forward thinking agronomists and crop their own country near Bellata, NSW) something that stood out this year was soil acidity in chickpeas. When I emailed James Miller to answer a few question about Satamap he finished with how Satamap has helped them identify and begin to look at ways to solve the problem with soil acidity. The response to my questions are below. – What reservations you before trying Satamap? We began using Satamap in early April 2015 to gain another view of crop production. Initially I was interested in comparing the images to previous yield maps and paddock histories and being familiar with NDVI, I was keen to observe whether these would correlate to the Satamap images. – Did it meet or even exceed expectations? Satamap images for the 2015 season and previous seasons (13 & 14) generally correlate very well to our current fields’ performance characteristics and where available previous yield maps reference very closely to the images. – How do you use it in your business? We currently use the images to evaluate crop performance during the season, further examine problem areas and scrutinise field trials and demonstrations for future seasons. It has been valuable in highlighting/emphasising areas of sodicity, salinity, acidity, heightened weed activity, missed strips in spraying and planting, varietal differences and compaction. – Does it add value to your business? – Will you continue to use it? Yes, I think it broadens our field ability. At present we are referencing the 2015 Satamap images with yield maps to produce variable rate application maps for soil ameliorants such as lime and gypsum. One current field we are working on is pictured below. It will be receiving variable rate lime application to assist with pH deficiencies and excess nutrient solubility namely, Al and Mn associated with this. The brown-yellow to light green areas have been consistently lower performing sections of the field highlighted through yield maps and observed crop scouting. These areas have been grid soil sampled using the Satamap images, with results confirming the need for amelioration with lime. Below are two Satamap images showing the crop biomass response in a deep ripping trial to decompact soil (Sand) that was previously compacted by random traffic, clay spreading and incorporation. The trial strip was ripped to 600mm using a Grizzly deep digger in March 2014, a 12% yield response was achieved in 2014. With the visual response observed in the Satamap images this season (2015) we are expecting a much bigger yield response. The ripped treatment has handled the dry Spring conditions much better with its ability to access soil moisture much deeper in the soil profile. The Satamap imagery has been a useful tool to further validate the response to deep ripping before implementation on responsive soil types over the whole farm. Thanks for checking out the new website.